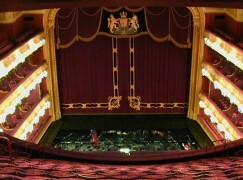 Kasper Holten’s departure as director of opera at Covent Garden removes a cornerstone of company stability. The Dane has dragged the Royal Opera, often kicking and sometimes screaming, into a more adventurous production style and a more open relationship with public and media, not always to the satisfaction of the moneyed classes that put in the big donations. Significantly, Kasper built a symbiotic relationship with the music director, Antonio Pappano, who had originally talked of leaving in 2013 but stayed on for the sheer stimulus of working with a sympathetic partner. With Kasper going, Tony will feel unsettled. The pair have laid long-term plans running into the 2020s, but that could change with a new director. There are undertones of uncertainty ahead in today’s press release. Covent Garden will have to rethink itself, never an easy task. Ridiculous short list of successors..John Berry..no one would touch him in a million years..this is all complete subjection on your part..no fact or knowledge to anything you have written here. Not all ridiculous – Graham Vick and Pierre Audi would both be front runners on anyone’s list. Wasfi Kani would be a very bold choice. Graham Vick would be the best-qualified and able candidate – but why would he need it? He is very happy running things in Birmingham in exactly the model he devised. CG would be a step backwards for him. In his recent Birmingham production of Dido and Aeneas he banned all critics from reviewing the production! What do you base that on? Sounds like a gripe. I don’t know the man well, but it feels clear that productions and standards at ENO greatly increased in standard on his watch, so not an entirely daft suggestion to welcome him to CG – though obviously it is suggested tongue-in-cheek so soon after his departure from up the road. Good riddance to a talentless berk who should never, ever, have been appointed. Let’s see some better names? Deborah Warner? David Pountney? Nonsense. I have disliked several KH productions; but he is certainly talented, and from personal contact, not a berk, either. Far rather the youthful vigour of KH then dredging Pountney up for a retirement posting, surely! Correct me if I’m wrong, Mr L, but haven’t you always been in favour of raising money privately? Talentless? Berk? Disagree on both. Holten is a moron. The quicker he goes the better. Anyone who has worked with Kasper Holten will know that he is anything BUT a moron. In fact, a more inappropriate word could not be found. He has one of the sharpest, brightest, quickest, imaginative minds in the business. I can only speak from my own experience, of course. You don’t pay to watch the crap he inficts on us! A list of Holten’s successes – with taxpayer funds – would be a blank sheet of paper. The scandal is that he’s going to cling on until 2017. Any chance of British xenophobia at play in some of these comments? Kasper Holten’s immediate predecessor made some pretty dodgy choices of production, the last of which Holten most graciously defended to those too inexperienced in ROH lead times to understand the shows had nothing to do with him. But then she is “family” (BBC, Wexford, all that) rather than some foreigner from an obscure place called Denmark. However even this paragon spent seven years as Artistic Director of Royal Danish Opera – but as she doesn’t direct shows herself, won’t be called upon to fill up that “blank sheet of paper”. I loved Eugene Onegin (going back this month and would urge the production on others) and L’Ormindo, and am happy that some of my tax bill went into these and other shows at ROH. So don’t really see what the fuss is about, never mind a weird conspiracy theory suggesting Holten might prefer attending to his family instead of replying to random abuse on here (as he does as part of his job, unlike his predecessors or, incidentally, most others in similar posts around the world). But perhaps the world of opera types has a lot of people who don’t have kids, just as there still seem to be those who think “foreigners” are not fit to run the V&A or such. Georg Solti, Bernard Haitink, Antonio Pappano…? Are you also trying to make a veiled homophobic remark to the effect that opera lovers do not ‘have kids’? Do keep up, you at the back there! Do you not know how the ROH works? Solti, Haitink and Pappano did not do (do not do) Kasper Holten’s job at Covent Garden so not sure who is or isn’t keeping up. As for Holten’s family, I admit to being prejudiced against people who have no sympathy for a parent making child-friendly choices. Oh I see! The xenophobic Brits will have a ‘foreign’ Music Director but not allow one to be in charge of the stagings? It does not stack up. I have every sympathy for parents who wish to do what is best for their children, even when that uncannily coincides with an increase in the heat in the ‘kitchen’ for Dad! >>The xenophobic Brits will have a ‘foreign’ Music Director but not allow one to be in charge of the stagings? It does not stack up. That is actually rather interesting, for those of us (like indeed Norman Lebrecht himself) who have a feel for the history of the ROH. There was a time when, between the toffs on the board and the freemasons running the house, Johnny Foreigner was definitely allowed to wave the stick but, for reasons of cost, tradition or whatever, was far less welcome in other areas. But as soon as someone mentions the masons who run everything (now including the ROH! ), you know we’re in full-blown loony tune territory…! And why not a conductor – the only sensible artistic solution? Great – so let him run the house. What makes you think he would be particularly capable at running the non-musical aspects? Even if he was, would he want to? The current maestro is nearly too busy to devote time to the orchestra (the average standard of which has declined in recent years, IMO, rarely sounding up-to-scratch unless Pappano is in front of them) let alone run the place artistically. I’d recommend they steal the ‘level-headed’ and inventive David Agler from Wexford Festival Opera! Covent Garden should not take any risk. Take someone who’s been around for 30-plus years. And if from abroad; with a firm British background. Someone posh. Someone elitist, with a self-proclaimed disgust for elitism. Someone safe. No surprises please, we’re British.